A pocket-sized distortion powerhouse with more options than you’d expect in a box of this size. Parallel and serial blends offer plenty of sonic variation. We recently looked at the micro version of Pigtronix’s Philosopher’s Tone compressor, which condensed the original’s essentials into a practical footprint for modern ’boards. 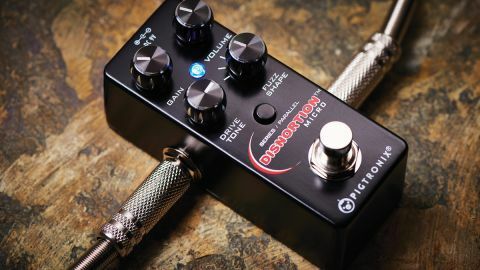 Now the company has done the same for its Disnortion, a large three-footswitch pedal that Pigtronix says remains in constant use with the likes of Queens Of The Stone Age, Aerosmith, Living Colour and Muse. So, will its micro-sized sibling have enough of the original mojo to hold its own in such illustrious circles? It continues the 18-volt headroom achieved by an internal converter from the nine-volt input, but where the original had three independent effects, this version loses the octaver and retains the fuzz and overdrive - both are now called up by a single footswitch. There’s a new feature, too: where the original fuzz and overdrive worked in parallel, this version also gives you the option of running the two serially with the six-stage CMOS overdrive circuit preceding the diode-clipping fuzz. The pedal has knobs to set the Gain and Output volume, plus a Drive Tone knob to tone down the overdrive’s top-end via a low-pass filter. There’s more radical tone shaping in the form of the six-way Fuzz Shape rotary switch, which follows the fuzz circuitry. This is actually a passive filter network providing a choice of six EQ curves. Selecting Parallel mode summons the more conservative side of the pedal. You get a blend of fuzz and overdrive, though it’s more overdrive in nature and has a range from clean boost, through really effective gritty just-breaking-up sounds, to a raunchy natural distortion with a crisp fuzzy edge and individual string clarity. The Fuzz Shape filter has some effect here in shaping the tonal balance with various midrange tweaks, but it’s in Serial mode that you really hear it working. Here, the Gain knob piles on wads of distortion and the nature of the fuzz makes its influence felt: if you like your fuzz/distortion on the edgy/nasty side, the Treble and Mid Scoop settings are the way to go, but all the settings offer a refreshing alternative from single-sound distortion pedals.